We went north with our boat, spending the month of July working ourselves north on Lake Michigan. 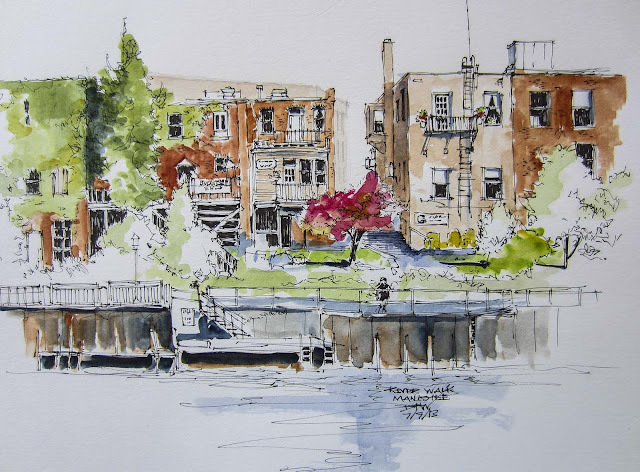 We visited various favorite ports where my wife enjoyed shopping and I had a chance to get out the pen and watercolors. 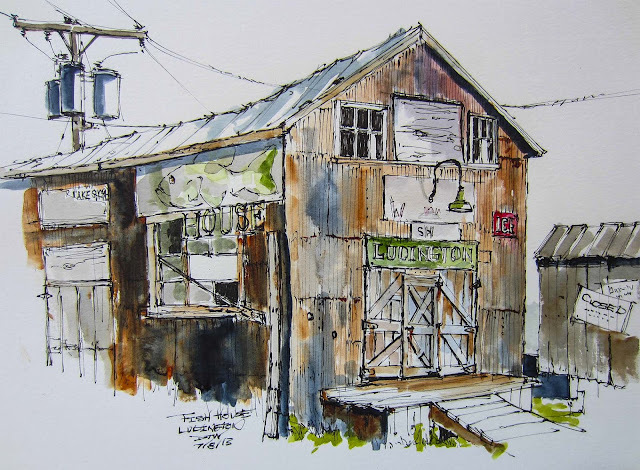 This first sketch was done in Ludington, Michigan and it pictures the old fish market that's located near where the car ferry Badger docks and departs and is across from the marina where we docked our boat. The old market isn't any more but the building still stands as an interesting accent to the waterfront. After Ludington we headed up the shore line of Lake Michigan to the town of Manistee. We like the municipal marina in Manistee because it has great facilities, is up the Manistee River so it's well protected, and it's right down town making for an easy walk to restaurants and the grocery store. Though we didn't see one this time, great entertainment at the marina is to watch large freighters (600-700 feet long) work their way up the river and through the drawbridge that is just up from the marina. The first day we were in Manistee I took the dog and walked up river on the river walk. I did this sketch of the back of buildings in downtown Manistee from across the river while sitting in a neat little band stand. Manistee was originally a logging town that at one time, during that era, boasted a large number of millionares who'd made their fortunes cutting, milling, and selling lumber. Awesome sketches! I particularly like the top one of the old fish market. The texture and character of the structure really comes through. Great stuff!!! these are beautiful! I especially love the depth...perspective...and light in the second watercolor.